Showcasing a cool and modern color palette of aqua, parchment, & peridot, Tangier Swags & Jabots are printed on a high count cotton sateen fabric which has a soft hand and beautiful drape. Made in the USA. A Pretty Windows exclusive. Swags & Jabots are a pre-pleated overlapping window treatment designed to fit 1" Double or Triple Curtain Rod Sets, depending on the width of your window. They may also be board mounted. 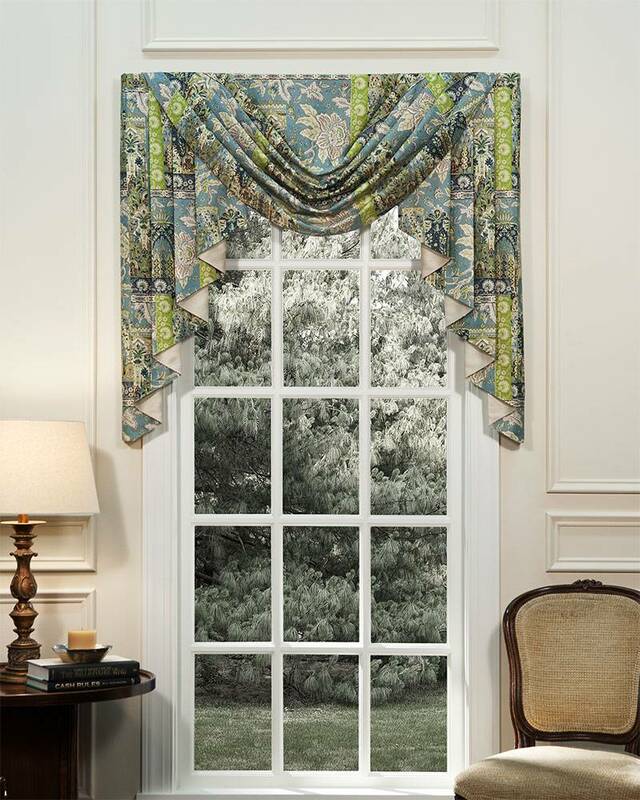 Available in 2 widths: 29" & 38"
The face of Jabots is 12" - total width with the return is 15½"
Our Jabots are made with a standard 3½" return, which works with the large majority of Double & Triple Curtain Rod Sets available in the marketplace. However, there are some rod sets with larger returns. Our Jabots can be special ordered with a different return depth. Please call (877-841-1315) and speak with one of our window experts if this is an issue.